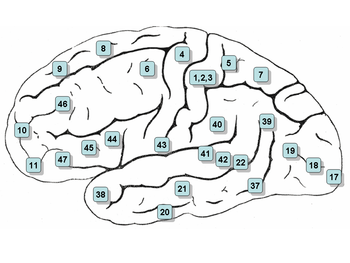 Medial surface of the brain with Brodmann's areas numbered. A Brodmann area is a region of the cortex defined based on its cytoarchitecture, or organization of cells. Brodmann areas were originally defined and numbered by Korbinian Brodmann based on the organization of neurons he observed in the cortex using the Nissl stain. Brodmann published his maps of cortical areas in humans, monkeys, and other species in 1909, along with many other findings and observations regarding the general cell types and laminar organization of the mammalian cortex. (The same Brodmann area number in different species does not necessarily indicate homologous areas.) Although the Brodmann areas have been discussed, debated, refined, and renamed exhaustively for nearly a century, they remain the most widely known and frequently cited cytoarchitectural organization of the human cortex. Many of the areas Brodmann defined based solely on their neuronal organization have since been correlated closely to diverse cortical functions. For example, Brodmann areas 1, 2 and 3 are the primary somatosensory cortex; area 4 is the primary motor cortex; area 17 is the primary visual cortex; and areas 41 and 42 correspond closely to primary auditory cortex. Higher order functions of the association cortical areas are also consistently localized to the same Brodmann areas by neurophysiological, functional imaging, and other methods (e.g., the consistent localization of Broca's speech and language area to the left Brodmann areas 44 and 45). Some of the original Brodmann areas have been subdivided further, e.g., "23a" and "23b". They instead used the cytoarchitechtonic scheme of Constantin von Economo and Georg N. Koskinas published in 1925 which had the "only acceptable detailed description of the human cortex". ^ Brent A. Vogt, Deepak N. Pandya, Douglas L. Rosene (August 1987). "Cingulate cortex of the rhesus monkey: I. Cytoarchitecture and thalamic afferents". The Journal of Comparative Neurology 262 (2): 256–270. doi:10.1002/cne.902620207. ^ Gerhardt von Bonin & Percival Bailey (1925). The Neocortex of Macaca Mulatta. Urbana, Illinois: The University of Illinois Press. ^ Constantin von Economo & Georg N. Koskinas (1925). Die Cytoarchitektonik der Hirnrinde des erwachsenen Menschen. Vienna and Berlin: Julius Springer. brodmann x func — Functional categorization of Brodmann areas. Brodmann, Mark Dubin pages on Brodmann areas. This page was last modified on 25 March 2009, at 14:27.